We are a natural stone and cabinet company serving the Boston metro area. As our name states, we focus on the splendor of natural stone, such as marble and granite, and solid wood cabinets to beautify your home. Offering a wide selection of both cabinetry and quality stone from which to choose from, Stone & Cabinets is also a stone fabricator, providing custom design and installation. While we are kitchen and bathroom specialists, our designers and installation technicians have the experience to bring any room or project to life before your eyes. Along with custom fabrication and installation of natural stone countertops and vanities, our professional handiwork extends to fireplaces, accent walls or wherever else you have in mind. Our team is well-versed in the art of cabinetry, as well, and can produce gorgeous cabinet designs in just about any room in the home. At Stone & Cabinets, your satisfaction is our number one priority. We look forward to working with you. 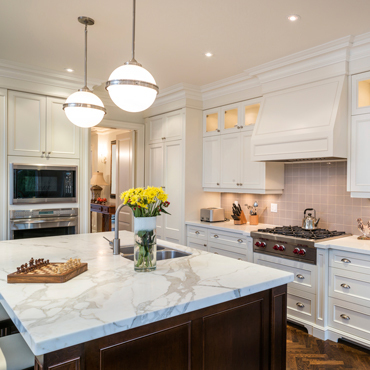 Our knowledge of cabinetry and natural stone is extensive in design, fabrication and installation. Our team has built its reputation on working with the client each step of the way -- with no surprises. At Stone & Cabinets, we provide fair and honest prices, and the highest in quality craftsmanship. You can rest assured that the professionalism of our entire team is unsurpassed in the industry. Our promise is to make sure you are completely satisfied once the job has been completed. We are among select companies accountable to a high standard in a network of industry professionals.